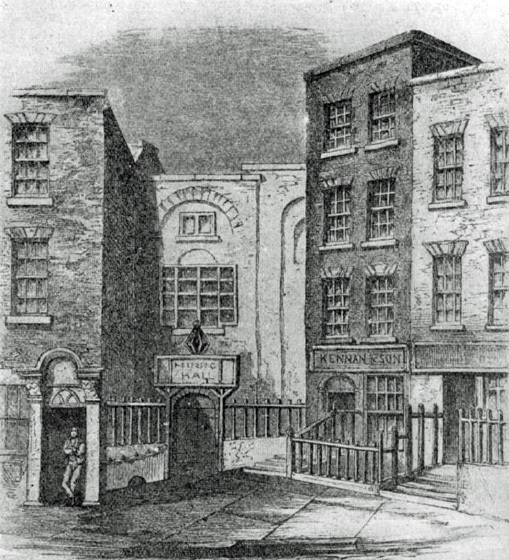 Handels Messiah was first performed in Dublin on 13th April, 1742. The video above shows the Messiah being performed as close to the original spot as possible in 2012, 270 years later (and the 21st time the recreation had been done). All that remains of the original location is the white arch on the right that can be seen in the background. (It’s next door to the George Frederic Handel Hotel, if you are looking for the spot.) It was a performance that received mixed reactions from Irish philosophers. Handel decided to premiere Messiah in Dublin after being invited to perform during the 1741-42 winter season there. It was a charity concert in aid of a number of charities including prisoners’ debt relief, the Mercer’s Hospital and the Charitable Infirmary. Positive reports from rehearsals lead to hundreds seeking to attend the concert, in a venue only normally seating six hundred. To accommodate the crowds, ladies were asked to leave their hoops at home, and gentlemen not to wear swords. But the concert had almost never happened. Handel had requested Christ Church and St Patrick’s Cathedral’s choirs to perform the piece. (The women’s roles were sung by established stage singers.) This was not an innovation; charity concerts at which the church choirs performed were a regular occurance. But Jonathan Swift as Dean objected to the choir of St Patrick’s Cathedral performing in a musical hall. In January, three months before the performance, he sent out a note entreating the subDean and chapter to punish any who should perform in “a club of Fidlers in Fishamble Street”. “My Resolution”, he concluded, “is to preserve the Dignity of my Station, and the Honour of my Chapter”. As Mr. Handel in his oratorio’s greatly excells all other Composers I am acquainted with, So in the famous one called The Messiah he seems to have excell’d himself. The whole is beyond any thing I had a notion of till I Read and heard it. It Seems to be a Species of Musick different from any other…tho’ the Composition is very Masterly & artificial, yet the harmony is so great and open, as to please all who have Ears & will hear, learned and unlearn’d. Synge attributed the greatness of the work to the care Handel took in composing it, to the subject (“the greatest & most interesting”), the “sublime” words and the lack of speeches which allowed the audience to remain engaged with the music. As for Swift, he was in decline. A month later he was taken in charge by guardians to look after his affairs. He died on 19th October 1745, aged 78 years. He left most of his fortune to found a hospital for the mentally ill, originally known as St Patrick’s Hospital for Imbeciles, which opened in 1757. The hospital, now known as St Patrick’s University Hospital, still exists today. Joseph McMinn (2010) Jonathan Swift and the Arts University of Delaware Press. Donald Burrows (1991) Handel: Messiah Cambridge University Press. Quote from Edward Synge on p. 19, from Patrick Delany on p. 21. A countdown to the next annual performance of Handel’s Messiah, Messiah on the Street is on the OLCS website. A longer film of the annual performance, this time from 13th April 2013.